Modica has been for centuries one of the main County and cit y of Sicily, a territory where baroque architecture, art and culture were considered the most significant levels of expression. Nowadays Modica is a principal agricultural and commercial centre. Most of its history has been related to the brilliant period and to the magnificence of the County, during which thanks to the evolution of economic, social, artistic and cultural structures, the County has imposed its prestige and its influence. Its topographical and urban structure is very particular, because it is lying and perched on three elevations sides, so that the city can preserve its attractiveness as ancient and important medieval village. The residential area consists of excellent proofs of distant eras, such as the majestic buildings splendidly adorned; a multitude of churches, some of sumptuous and elaborated architecture with priceless works of art inside, other simpler but at the same time considered as the witnesses of a past full of high values in artistic expression. In this large context of architectural, artistic, historical and panoramic heritage, are also inserted the phantasmagorical whirl of stairs, alleys and subways and the wonderful glimpses which express an ancient flavour of overlapping houses clung on ridges as in an inexorable race against time in order not to be forgotten. 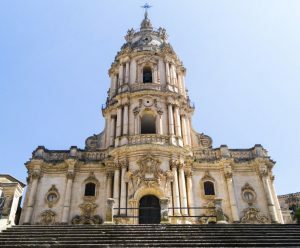 The most important buildings of architectural heritage, both civil and religious, reflect the eighteenth-century style, which is expression of the baroque used for the reconstruction post-quake in all the territory of Val di Noto: such as the Church of San Pietro, the Cathedral of San Giorgio, the Church of San Giovanni Evangelista, the Church and Convent of San Domenico, the Mercedari Palace, built as a Convent attached to Santa Maria delle Grazie sanctuary and others. In addition, there are some expressions of more distant eras, for instance the rupestrian Church of San Nicolò Inferiore and above all the remains of gothic-Sicilian art, like the Chiaramonte style, expression of the prestige of the County, like the Church of Santa Maria di Betlem with its Chapel Cabrera and Portal De Leva. Religious and popular folklore, craft and rural traditions, typical food and desserts deserve attention in order to improve the intimate knowledge of the city, because they can melt aristocracy and popular spirit.